All I can say to you right now is WOW! I got my workbook Monday afternoon and I am already on Day 5 module and have been reading all the ebooks to Kick Start my VA Business. I am able to really focus on what I want my services to be and my target clients. Thank you is not a strong enough courtesy for you and the tools you have provided me here so far. I can not wait to learn more and see what all you and the wonderful VA’s in the forum have to contribute to all of our success. THANK YOU, THANK YOU! 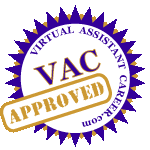 Hi, my name’s Gillian, owner and founder of Bushmills Virtual Assistance, and you must be someone who is considering purchasing the Virtual Assistant Career (VAC). I know, because 6 months’ ago, I was like you, reading all the testimonials and thinking it all seemed too good to be true. I even wondered if half the people giving the testimonials were fictional but, like I say, that was 6 months’ ago. Now, it’s a different story, and as I’ve now completed the VAC, I want to scream to people not to waste any more time and just click on the “Buy Now” button because it’s worth double its price in value and time. I had 20 years of secretarial experience and then at the ripe old age of 35 I became a full-time mum and I honestly thought that was it, I’d never have time to work again. Then I realised that I didn’t want to work again as my family life was more important to me and the thought of juggling a toddler and “office politics” was right up there with “going to the dentist” on my “least favourite things to do” list. That’s when I heard about Virtual Assistance and I was amazed at the number of hits when I searched the internet. 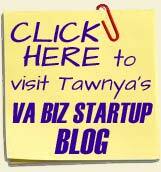 However, Tawnya’s VAnetworking,com site stuck out by a mile. I couldn’t sleep at night because my mind went into overdrive thinking about all the possibilities ahead of me. Then panic set in and I wondered if I was capable of setting up my own business and that’s when the VAC saved me. Reading samples from the modules just made it seem so easy – and it is, it’s all there for you, every single step of the way. It doesn’t tell you to breathe or use the washroom but it may as well because it will guide you through every process of setting up your VA business. I’ve always been skeptical of paying for something I’ve found online and so were friends and family when I told them but it’s not some sort of scam, it’s not promising that you’re going to make millions as soon as you receive it. YOU have to do the work, module by module, but boy is it made easy for you. I actually felt guilty that I enjoyed working through it! Before the VAC, I wouldn’t have had a clue where to start building a website, never mind what to put in it. This is definitely a tribute to the VAC, from help designing the logo and brochure; determining rates and policies, etc – and, it didn’t cost me a penny, even the hosting of the site is free for a year with your purchase. In summary, I wouldn’t start swimming lessons without having water to dive into. 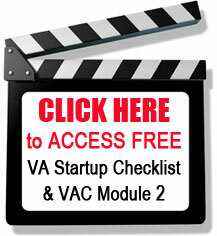 Why would you start your VA business without having the VAC to dive into? Buy it, enjoy it and live the dream of being able to choose the work you enjoy from the comfort of your own home – I did. Thanks for your help, Tawnya. CLICK HERE to read testimonials from VA industry leaders from around the world.